Medium control means it smooths the lumps and bumps but is comfortable and forgiving so if you eat a big lunch, you aren't going to feel too restricted. These are the most lightweight shapers. Super control means this shapewear flattens your tummy and shapes your body - giving contours to the curves. It is like medium plus. Not the maximum shapewear but more supportive than the medium level. Spanx super duper control is for when you want to, look like you have dropped pounds and inches. These shapers target specific problem areas using compression. They might feel more restrictive and you may choose to save them for special days or evenings. 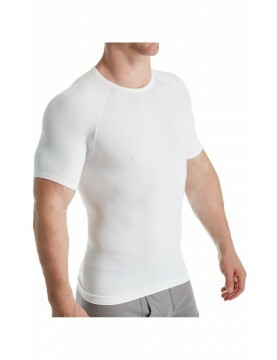 Spanx Men's seamless undershirt is designed with compression zones that target the core for everyday shaping. Comfortably transform your torso—look sharper, stand taller, and feel stronger.